One of the most distorted Italian recipes in the world is Carbonara or Spaghetti alla Carbonara. Yes, in the world. Because in Italy too many people don’t know how to make it. It is not a matter of where you are in Italy. For example Neapolitan pizza has its own recipe that has been adapted according to the place where is made. Carbonara has only one way to prepare it and in Rome they know how to do it. All the others are distorted. If you ask to different Italian people they will probably answer you that they use cream or grated parmesan. Well, they are completely wrong. I will explain you which is the real Carbonara recipe, but first discover with me which are its possible origins. Until now this recipe has the most controversial origins. 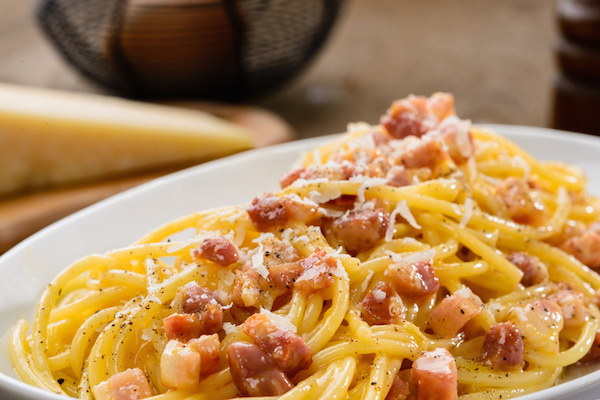 While the other recipes have different origins but each of them is connected with ancient past and have possible origins despite the legends, in this case we are not so sure about when and why Carbonara was born. What we know for certain is that until 1930 the recipe didn’t exist. Why? Because when you are looking for the origin of a recipe you need to take a look at cookbooks. Ada Boni gathered all the Roman recipes in a cookbook and didn’t mention Carbonara. The cookbook was published around 1930. Therefore Carbonara is a recipe born after that date. But when was it born? Probably during World War II. In the Appennines a German defensive line, called Reinhard line, was created just to delay the Allies’ arrival to the Gustav Line. In that area there were soldiers coming from different countries, like the United States, and the line was at the intersection between Lazio and Abruzzo. In Abruzzo people used to prepare Cacio e ova (cheese and eggs). It was a dish eaten by carbonai (or carbonari in Roman dialect), people who worked the coal. They prepared Cacio e ova (cheese and eggs) and the day after they ate it for lunch when they were at work. Carbonai were poor and used to eat what was easy to find and to preserve, like eggs and cheese. American soldiers, far away from their home, saw local people eating Cacio e ova, which together with the bacon represent the typical ingredients of an American breakfast. And so Carbonara was born. As you can see Carbonara is not an Italian invention. Strange, isn’t it? From the Appennines Carbonara recipe arrived to Rome where families started to hand down the recipe: that’s why everyone knows that Carbonara is a Roman recipe. But there are 2 other possible origins. The first one is that a carbonaio in Rome opened a tavern preparing a dish similar to Carbonara, that he called it this way to honour his previous job. The second one is linked to Northern Italy. In November 2005 an Italian food & wine magazine said that Carbonara was born about 200 years ago in Polesine (Veneto region). A group of Carbonari (how Italian rebels of the 19th century are called) used to meet up secretly at Osteria delle Tre Corone, a roadhouse still existing, where you can taste Spaghetti alla Carbonara. The only ingredients you need for a ‘real’ Carbonara are: eggs, cheek lard, Pecorino, pepper. And that’s all! No Parmesan, no onions, no bacon, no cream. Please do NOT use freeze-dried or Carbonara aroma products sold outside Italy. You can’t do a Carbonara with such of those things. Use only fresh ingredients and the result will be the best one. The most common problem is to cook the eggs instead of making a sort of cream with them. To avoid this problem people use cream, but it is not an ingredient as you read before. You just need to try and try again, considering that eggs cook at 75°C degrees. So you can cook pasta, switch off the fire and then pour the eggs on pasta mixing everything quickly. I really thank you Veruska Ankonitano for the picture and the recipe. She is a Roman food blogger living in Dublin. Here is the link where she explains how to cook the real Carbonara. If you would like to try, you can subscribe to our newsletter and download the real Carbonara recipe.